Nissan gives its flagship Maxima sedan a minor design refresh for 2012, equipping it with an updated front fascia, some new interior treatments, new wheel designs and two new exterior colors, all while holding the line on pricing. The 2012 Maxima lacks the interior storage spaces found in a number of competitive vehicles, and some owners report minor build-quality problems with their Maximas. While it's neither the sportiest nor the flashiest vehicle in its class, the Maxima delivers a good all-round package, thanks to its well-equipped cabin, capable engine, efficient transmission and wide range of available options and packages. A minor design refresh for 2012 doesn't quite go far enough to help the Maxima stand out in a very competitive class, and some reviewers question the balance between the Maxima's amenities and pricing. But owners who have shopped around before choosing the Maxima report that they're very happy with their selection. The 2012 Nissan Maxima midsize sedan displays an updated exterior design and a few new interior features for 2012. Exterior updates include a redesigned front grille, new headlights and taillights, and new 18- and 19-inch wheels. Nissan also offers the Maxima in new Java Metallic and Dark Slate exterior colors. Inside, the Maxima gets a new Cafe Latte interior color, a new white illumination background for the instrument gauges and new standard Dark Piano hairline trim, as well as new optional Atlantic Cherry wood-tone trim. Nissan also redesigned the audio display and climate-control knobs for better ergonomics. In addition, the automaker offers a new Limited Edition Package for 2012. It adds such features as a dark satin chrome front grille, HID headlights with a smoked appearance, foglights, a rear spoiler and unique 18-inch Dark Hyper Silver wheels, as well as upgraded exterior mirrors with integrated turn signals. Inside, additional features include a compass on the rear-view mirror and metallic trim on the center cluster, console and door armrest grips. The Limited Edition Package joins currently available Sport and Premium packages. The 5-passenger Maxima comes in S and SV trims for 2012, both equipped with a 3.5-liter V6 engine. 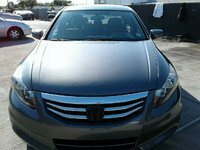 Competitors include such upscale sedans as the Acura TL, the Lexus ES, the BMW 3 Series, the Mercedes C-Class, the Toyota Avalon and the Cadillac CTS. While the Maxima matches most of its competitors in ride and performance, it doesn't carry the same brand recognition as entries from BMW, Mercedes, Cadillac and Lexus and struggles to compete on price with some similarly or better-equipped competitors. On the plus side, the Maxima delivers more headroom than many of its class competitors, making it a good choice for taller drivers, and the recent exterior updates, as well as a sculpted appearance, should help keep it a notch above the midrange family sedans nipping at its heels. 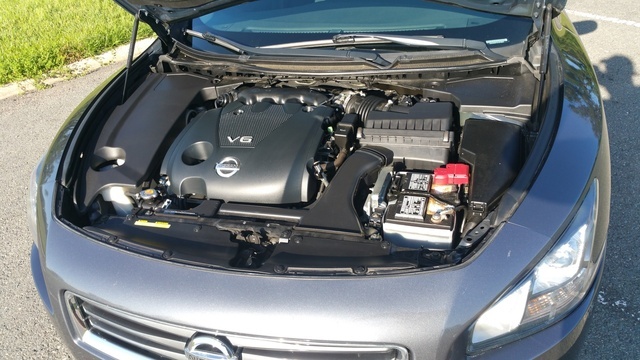 Power for the Maxima continues to come from a 3.5-liter V6 engine generating 290 hp and 261 lb-ft of torque. That horsepower number compares to 240 hp for the BMW 3 Series, 268 hp for the Lexus ES, 280 hp for the Acura TL, 302 hp for the Mercedes-Benz 3-Series and 318 hp for the Cadillac CTS, placing the Maxima at about the middle of its class performance-wise. The refined powerplant features Continuously Variable Valve Timing Control System (CVTCS), a variable induction system and electronically controlled throttle, as well as molybdenum-coated lightweight pistons and microfinished crank journals and cam lobes. Nissan pairs the V6 with an equally refined Xtronic CVT transmission with a manual-shift mode, as well as a DS (Drive Sport) shift mode for a more spirited driving experience. Mated with the CVT, the V6 posts fuel-economy numbers of 19/26 mpg. An optional Sport Package for the SV trim adds steering-wheel-mounted paddle shifters. The Maxima accelerates quickly and performs well at highway speeds, with plenty of power reserved for passing and aggressive moves. In addition, the V6 emits a satisfying growl, and the CVT shifts seamlessly and efficiently. However, the Maxima doesn't quite match the performance of more sport-oriented peers like the Cadillac CTS and Acura TL. While Nissan positions the Maxima as a 4-door sports car, some test drivers say it doesn't quite live up to that billing, especially when compared to a number of its competitors. 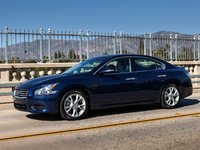 The Maxima doesn't handle corners as well as the Cadillac CTS or Acura TL, for example, and lacks the performance to deliver an exhilarating ride, according to testers. However, the Maxima moves along quickly and delivers a smooth, capable ride that will appeal to most owners. The responsive vehicle-speed-sensitive power steering system provides precise handling, and the performance-tune suspension ensures that the Maxima ably handles most driving situations it encounters. The Maxima rides on an independent strut front suspension and an independent multi-link rear suspension, with stabilizer bars in the front and rear. In addition, Nissan reinforced the front strut towers to ensure a stable, solid feel in the front end. Four-wheel disc brakes deliver good stopping power. 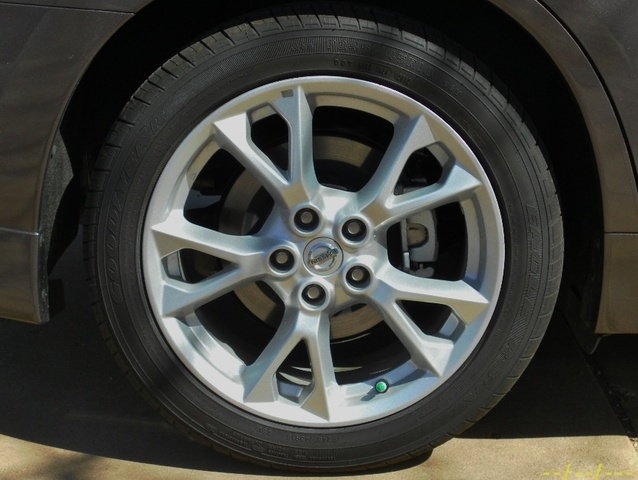 Both trims come equipped with new 18-inch aluminum-alloy wheels with Fine Silver finish and all-season tires. A Sport Package for the SV adds a sport-tuned suspension with retuned shocks and struts, stiffer springs and a larger front stabilizer bar (26.5 mm vs. the standard 25.4 mm). In addition, Nissan reinforces the trunk chassis to minimize flex and vibration. The Sport Package also includes a dark-finish sport grille, smoked HID headlights, a rear spoiler and new 19-inch aluminum-alloy Dark Hyper Silver wheels. Overall, the Maxima's interior gets high marks for its comfort and style, as well as its strong list of standard features. The comfortable front seats provide plenty of support, with good bolstering and plenty of room. The rear features two bucket-style seats with a small rear seat that might be tight for an adult. Some reviewers note that there's also limited headroom in the back due to the sloping roofline. High-quality interior materials ensure an upscale feel, while the well-designed wraparound dash puts most controls within easy reach of the driver. The Maxima offers 14.2 cubic feet of cargo space in the trunk, which is about average for the class. In the standard package, the front seats include 8-way power adjustment for the driver and 4-way power adjustment for the passenger. The S trim comes with cloth upholstery, while the SV adds leather upholstery, as well as power lumbar support and a manual thigh extension for the driver's seat. The rear seatback splits 60/40 and folds down on both trims. A leather-wrapped steering wheel and shift knob also come standard. Other standard features for the S trim include Nissan's Intelligent Key with push-button ignition, dual-zone automatic climate control, a tilt/telescoping steering wheel, illuminated steering-wheel-mounted cruise and audio controls, an auto-dimming rear-view mirror, a multifunctional trip computer, Bluetooth and power windows and door locks. Both trims include a power sliding moonroof, as well as an 8-speaker AM/FM audio system with an in-dash 6-CD changer and an audio input jack. Owners can add an optional 9-speaker Bose audio system with SiriusXM satellite radio, a USB port and speed-sensitive volume. The optional Sport Package for the SV adds a heated and cooled driver's seat, a heated passenger seat, upgraded leather upholstery and interior metallic trim, while a Premium Package equips the SV with such additional features as a dual-panel moonroof with power-retractable sunshades, a rear-window power sunshade, Atlantic Cherry wood-tone trim, a 7-inch color monitor and the Bose audio system. The 2012 Nissan Maxima received a top safety rating of Good from the IIHS, due to a Good rating for protecting passengers in frontal and side-impact crashes. However, the Maxima received only an Acceptable rating for protecting passengers during rollovers. 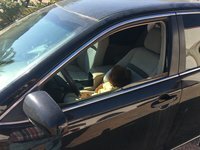 The NHTSA gave the Maxima an overall rating of 4 out of 5 stars, which breaks down to 5 stars for protecting passengers during side-impact and rollover crashes and 4 stars for front crashes. The Maxima comes equipped with Nissan's Advanced Air Bag System, which includes dual-stage front, front seat-mounted side-impact and roof-mounted curtain side-impact airbags. Other standard safety features for the Maxima include Vehicle Dynamic Control, traction control and a tire pressure monitoring system. The Nissan Maxima delivers an all-around, upscale package that appeals to owners, many of whom looked at quite a few competitive vehicles before choosing the Maxima. For instance, owners say that while the Acura TL might be a little sportier, the Maxima offers more trunk space and interior headroom. In addition, owners say the Avalon lacks a sporty demeanor, while the BMW 3 Series feels a little smaller than the Maxima and the Lexus ES comes up short on headroom. So for many owners, the Maxima provided the best combination of upscale amenities, interior space and sporty handling. Owners also like the Maxima's exterior styling, as well as its solid build, quiet cabin and capable performance. On the down side, the Maxima lacks the storage spaces found in some competitive vehicles. In addition, some owners report build-quality problems with their Maximas, but those issues seem to be isolated. What's your take on the 2012 Nissan Maxima? 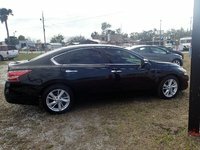 Have you driven a 2012 Nissan Maxima? Got into my car this morning and it turns over, makes all the sound effects, lights working but car won't start. I am selling my car. Can Cargurus finance the buyer?